Great news! The band has just been booked to play Margate Rhythm and Rock Festival in September, and the duo has been asked back to play at Matt and Phreds in Manchester, on 2nd July. Wonderful! Exciting news: the band has been booked to play a second blues festival in France, this time in Brittany, later in the year in October. Further details will be released shortly. The band plays it's first festival on mainland Europe when it play The Potatoes Blues Festival, in Normandy. We catch an early ferry, and play later that night....ON MARCH 29th! The band embarks on one of its mini-tours in May when it heads South to play at Tring Blues Bar, The Railway, Oakham and finally Essex BluesRock Fest on 16th to 18th May, respectively. Really looking forward to it! Following the duo's hugely successful set on the Jaks Blues Matters Stage, at The Greast British Rock and Blues Festival ,Skegness, I CAN NOW ANNOUNCE that the band has been booked to play the Little Muni Stage at the Colne Great British Rock and Blues Festival, in September. Other Festival appearances already booked this year includes The Secret Blues Festival, Scarborough on 23rd March (duo), the Potatoes Blues Festival, in Normandy, on Friday 29th March...our FIRST EUROPEAN FESTIVAL, and Essex BluesRockFest at Barleylands on 18th May. The band is playing a sold out gig at the Peacock, Sunderland, on 27th December, along with ex-Dance Class Dave Taggart, and STAN, the band. This completes a great 2018 for the band....and 2019 is already looking good. Thank you to everyone who has shown interest in, or supported the band in any way, during the last year. On behalf of the band I wish everyone a wonderful Christmas and New Year, and a happy and successful 2019! The band has a new bass player....ex Lucas Tyson, Cirkus, music entrepreneur and all-round decent bloke...John Taylor. He replaces long serving Stu Burlison. We are sorry to lose Stu, but he has decided that he wants to pursue other musical avenues. An old mate, and always will be, we wish Stu all the best in the future. The band was due to play at the prestigious Bassment in Chelmsford on 15th November but, due to work commitments, the duo of George Lamb and myself will be playing the gig. Many thanks to Nick Garner for his understanding regarding thius matter. Also, many thanks to David Gray, who has arranged for the duo to play the following night at The Sir John Moore Cellar Bar, Appleby Magna. Christine and Tony Moore are major contributors to the development of blues music in Britain. First with Blues Matters, and now with Blues in Britain magazine, they give massive support to gig and festival organisers. 'George Shovlin & George Lamb in Concert at the Cross Keys at Thropton . Two supreme artists and entertainers , both legends in the North East Music Scene , George Shovlin has organised Music Events , Speak Easy's , Folk Clubs that have been at the forefront of the musical and cultural scene in Sunderland , Newcastle and through out the Northern Region , he is a singer/ guitarist , raconteur and a Force of Nature. George Lamb is one of the most talented guitarists in Britain ,subtlety, feel, clever riffs.... George has it all. a clever, clever guitarist and all of it delivered effortlessly. Really pleased with festival work this year. Following on from our booking to play at the Ilkley Blues Festival in October, we've just been booked to play the Orkney Blues Festival, at the end of September. At our recent performance at the Durham CC 20/20 cricket match at the Riverside Stadium, Chester le Street, we featured the incredible Marcus Browne on keyboards. Great! Some special news for all website followers.....our gig at the Tyne Bar, Newcastle, on the 27th May, will feature amazing keyboard player, Paul Wilson, who played so wonderfully on our latest album. 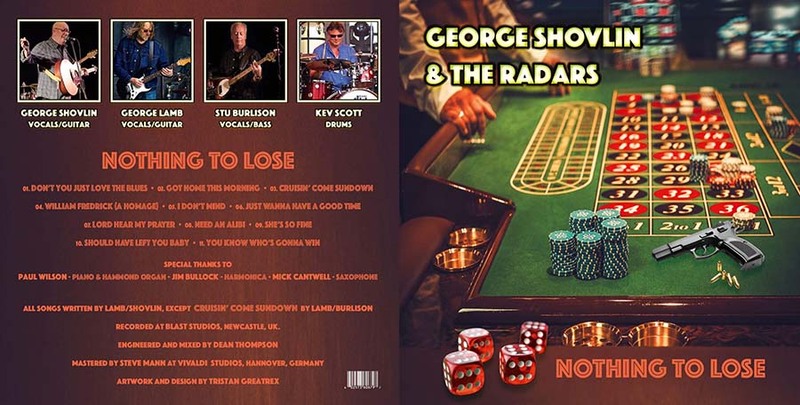 Our new CD 'Nothing To Lose' has received some wonderful plaudits and comments. 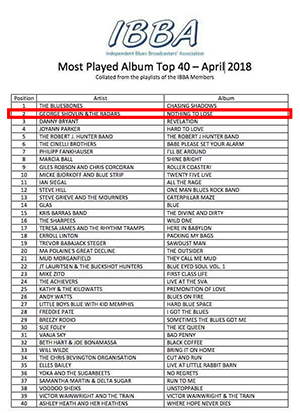 First we heard that it was to be one of four IBBA 'Albums of the Month' for April, then, in early April we discovered that it was placed !st in the IBBA 'Top 40', for March, followed amonth later by the news that it was placed 2nd in the 'Top 40' for April. 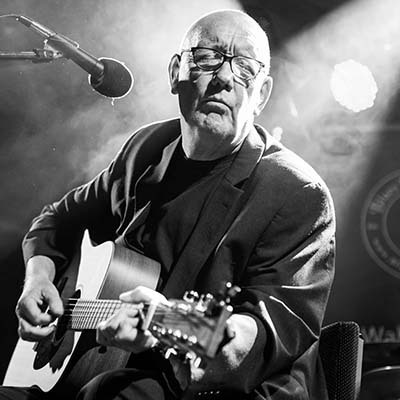 Having pursued a distinguished career as a teacher whilst also establishing a reputation as the award winning "Godfather of North East (of England) Blues,"George Shovlin in his retirement is proving that he is a major UK talent following a successful national tour and this ground breaking album of original blues songs, Nothing To Lose. Thursday 4th April - GREAT NEWS! 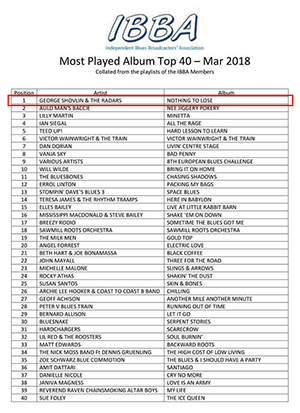 After our album 'Nothing To Lose' was voted by the IBBS broadcasters to be one of their four 'Records of the Month' for April, we then discovered that the album had come Number 1 in their Top Forty for the month of March. Great! 'It’s useless trying to translate a live music experience into words…. as they say ‘You just had to be there’. 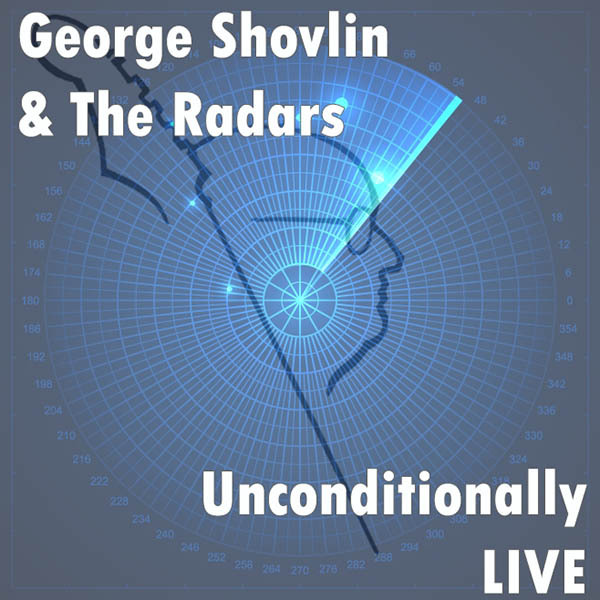 Thankfully a great audience were there when George Shovlin led his band of merry men onto the stage at The Tuesday Night Music Club and those in attendance will now be out there, once again, telling people to go and see George Shovlin & The Radars. So what makes this band a ‘must see’? Well let’s look at the component parts. First, of course, you have George Shovlin himself - seated throughout but no less a showman for that. From the off he made a connection with every person in the room and without playing a note we probably would have listened to him chatting all night. The intros to songs and the general banter and humour had smiles on everyones faces - not a bad foundation for a nights entertainment. And then he sung. His gravelly voice went from a whisper to a roar with every word conveying an emotion. This wasn’t someone just running through a bunch of songs. This was someone who conveyed the meaning in each phrase and, in so doing, involved us all in the songs. Then you have George Lamb on guitar. This is a player who does with each note what George Shovlin does with each word - he invests it with feel and emotion. Sure he can play fast, intricate runs when he wants to but that’s not his style. He makes those guitars talk and tells the story - why play flurry upon flurry of notes when just one will leave the audience breathless. To pick one song to give you an example of what we mean is difficult but ‘William Fredrick (A Homage)’ from the bands new album is probably a good start. And underpinning all this are Stu Burlinson on Bass and Kev Scott on drums. When we talk of rhythm sections the word ‘tight’ gets bandied around a lot. Well these guys are the definition of that word. Understated and concentrating on just pinning the whole show down. They play gently when needed but when the groove is required these two can lay down some of the funkiest blues beats in town. We swear if we’d removed all the chairs in The Club we would have had everyone up and dancing to these two alone. TOMORROW IS THE DAY! 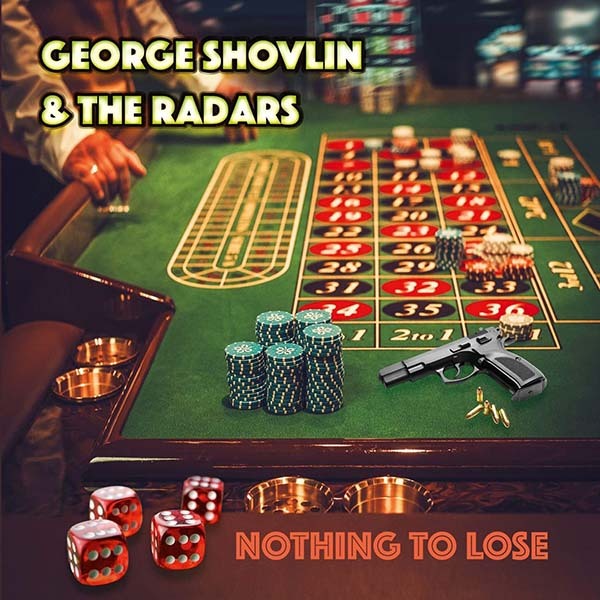 THE EAGERLY AWAITED NEW ALBUM BY 'GEORGE SHOVLIN AND THE RADARS' - 'NOTHING TO LOSE' - BECOMES AVAILABLE'. or, hopefully, through iTunes, Spotify, Amazon and other musical platforms. The album has already had numerous radio plays and pre-release sales have produced a fantastic respone. So, here goes....if you like the band I think you'll LOVE this album! As the band prepares to embark on it's first tour of SE England, the excitement mounts with the release of the new album, 'Nothing To Lose', on Thursday 1st March. The album can be purchased through the website or digitally from iTunes, Spotify, Amazon and other platforms. "First class blues rooted in the heart of the North East....."
Available for bookings throughout 2018.